Under 30's versus over 30's 2 innings match in warm conditions of true Indian Summer. Once again, top class fun organised by OJ. Veterans compromised by Test match pace opening partnership in first innings, dodgy umpiring, and it has to be said some highly skilful performances from younger members of the U30's. For over 30's injuries included one groin strain and black eye sustained by CS attempting to catch ball with nose......we will all return next year older and wiser. Wonderful end of season juniors match against Little Paxton on playing field....LSVCC juniors running out narrow last over losers, but all played excellently and represented the club with distinction. Well done to all, not least the coaches ! Towards the end of summer now, but fine day for now traditional (second anyway, last year rained off) LS ASHES...for those not at the first fixture, the ashes arose from Freddie Pullans bat which was cremated in CS's fire after shattering. Now encased in copper pot and awarded each year to winning team of Church (captained by Bernard Hopperton, sadly injured and off for knee replacement the next day) versus Village (nimbly skippered by Charman of PC Tony Moss). 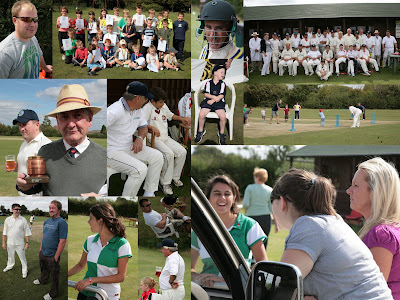 Large crowd gathered throughout day to watch firstly a juniors game of KWIK CRICKET on square, then highly tense last over finish in which OJ scraped the Village side home again through mixture of big(ish) hits, and multiple lives (dropped catches). Highlights included a 5-for from Daniel of the Church side, quite possibly the most ludicrous golden duck (RS) achieved through an acrobatic pirrouette leaving the bat face down on top of stumps, and Mr Finch's resurrected cricketing skills and bad back. Scorers kept calm despite increasing pressure as end neared....many thanks Catherine and umpires Roy and Martin ! Best all rounder - Tommy Bates and Michael Richardson. Best bat - Laurie Stothard and Adam Richardson . Best fielder - Jake Richards, Joseph Bates. Best catcher - Joseph Smith and Sam Edgeley. Keenest cricketer - Benjamin Smith and George Miller. Tried the hardest - James Price and Neve Palmer. Most entertaining cricketer - Jacob Jones and Emma Edgeley. Well done to all our juniors - it is fantastic to see real progress being made. To complete a successful season, there will be a regular practice session on Wednesday 9th at 6 pm followed by a match against Little Paxton Juniors on 13th September, 2pm. The 2010 season is expected to start first week after Easter, tbc. Any queries, contact Richard Smith or Roy Palmer. Most of all thanks to Tony and Bernard for organising the day, and to Kevin and Maria for suppling refreshments and spectacular paella to finish. Also to Roy Palmer and Richard for all hard work with Juniors over the season. ...a real Village day I thought, and excellent advertisement for the spirit of our community. Q. Do you think toilet facilities should be installed in pavilion - 22 votes for yes, and no votes for no.